Adobe Photoshop CC - Create anything you can imagine. Anywhere you are. Just about every creative digital project has Photoshop at its core. The world’s most advanced image editing app lets you enhance, retouch, and manipulate photographs and other images in any way you can imagine. It’s used by photographers, designers, web professionals, and video professionals, and it’s available only in Creative Cloud. Crop your photos with Content-Aware technology to preserve the look of your image and make precise portrait adjustments with Face-Aware Liquify. Jump-start your designs for brochures, business cards, and more with free high-quality Adobe Stock templates that you access from the File > New menu. Browse and purchase millions of images and graphics from Adobe Stock inside Photoshop. Right-click a stock image to do a visual search for similar images. Stock now offers a premium collection of curated images from top creatives as well as design templates and 3D objects. Crop your photos with Content-Aware technology to preserve the look of your image, and make precise portrait adjustments with Face-Aware Liquify. Photoshop CC opens documents faster and delivers greater responsiveness. Plus Content-Aware Fill is up to 3x faster with even better results. Jump-start design projects with easy access to presets as well as free Adobe Stock templates that you can access right from File > New. Yes. 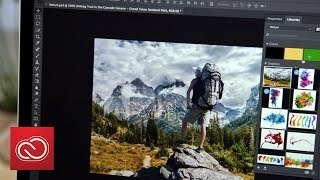 You can download and install Photoshop on multiple computers regardless of operating system. However, activation is limited to two machines per individual associated with the membership. What is Adobe Photoshop Lightroom® and how does it work with Photoshop CC? Photoshop CC is available as a standalone application or as part of the Creative Cloud Collection on both monthly and annual plans plans.